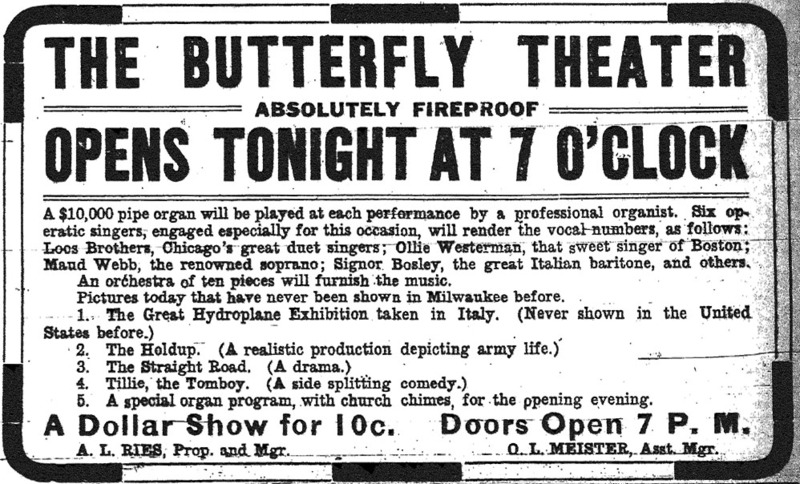 The short lived Butterfly Theater was opened on Saturday, September 2, 1911 on 212 West Wisconsin Avenue. 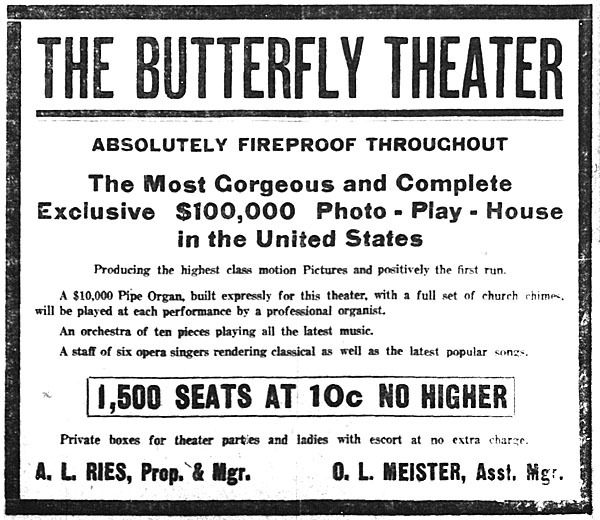 The theater was razed eighteen years later in January of 1930 to make way for a more modern theater called the Warner. Although it was large for the standards of the day, it was outdated by the time talkies were the standard. The brilliant exterior shone with hundreds of lights and a large lighted butterfly along with enough ornamentation for a dozen other buildings. 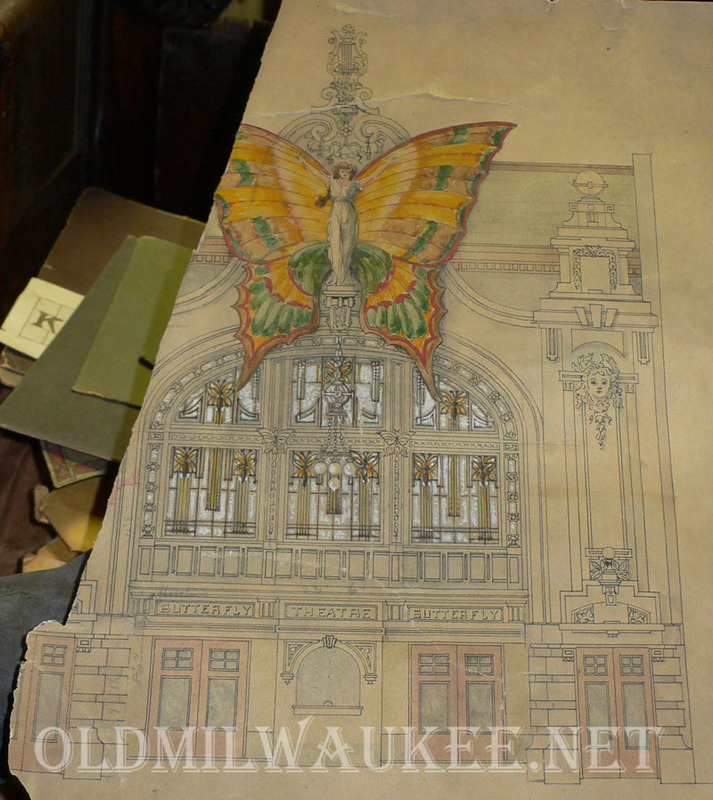 The sketch below was made by the designer of the stained glass on the exterior and shows in detail the huge woman/butterfly that was mounted on the facade. the butterfly measured 27 feet from wingtip to wingtip. The interior had seating for 1,500 in the best leather upholstered seating. The balcony had sixteen box seats which sat eight people each and there were twenty-five additional box-seating areas on the main floor. A huge, expensive pipe organ was installed as well as room for a ten-piece orchestra. 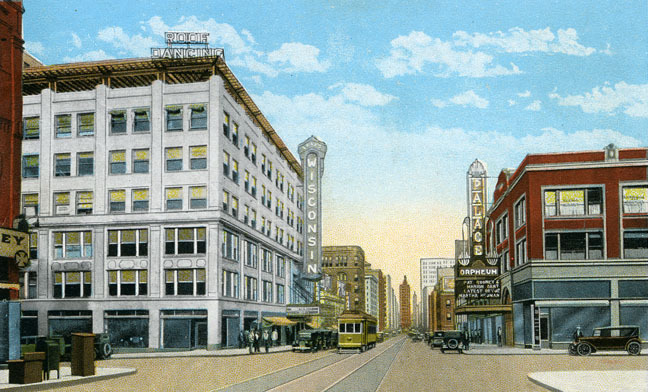 This is an old postcard view of Sixth and Grand Avenue as it looked in the 1920s. 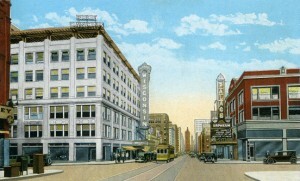 The view looks east and shows two big theaters that once graced the Avenue. On the left is Saxe’s Wisconsin and on the right is the Palace Orpheum. The Saxe Wisconsin was in what was known as the Carpenter Building and had bowling alleys and a popular dance ballroom on the roof.